Worthing veterinary group Grove Lodge has urged police to look again at the ‘Croydon cat killer’ case after questioning the theory that foxes or wild animals were responsible for deaths they had dealt with. In a statement on its Facebook page, the practice said it had examined a number of ‘poor animals’ with injuries ‘consistent with human intervention’. Its opinion ran contrary to the Metropolitan Police’s conclusion – following a lengthy investigation – that hundreds of reported cat killings across the country were not the result of a human killer. 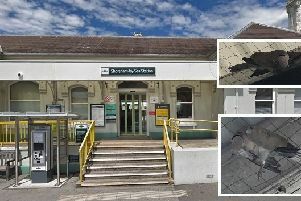 The statement, which came with the warning ‘Possibly distressing content’ said: “Dear All, Grove Lodge would like to publicly come out and support SNARL (South Norwood Animal Rescue Liberty) in their continuing investigation into the horrific cat killings that have been occurring in the last few years - mainly in the South East. “We have sadly had to examine a number of these poor animals and we feel professionally that these animals have not been killed by foxes/other wild animals. “The wounds are very clean and clinical and consistent with human intervention. Police urged the public to contact the RSPCA in the first instance where they have concerns about animal welfare, especially in cases where there was no direct evidence of human involvement. The Met Police said that in November 2015, officers began an investigation into reports from members of the public of mutilated cats, often found with their heads and tails removed, in Croydon and the surrounding area. Officers worked closely with the RSPCA and local charity SNARL from the outset. Police said there was no evidence that any of the cats had been killed by a human, however media reports of a ‘Croydon Cat Killer’ or an ‘M25 Cat Killer’ led to widespread public concern about cats being harmed and subsequently many more allegations were received.